If you’re looking for a little something to get your creative juices going during the holiday break, I have just the thing to try out. Recently, I’ve run across an amazing Web-based toolset from the folks at Aviary. This fairly robust toolset contains an image editor, an effects editor, a color editor, a vector editor, an audio editor, a screen capturing tool and an image markup editor. Unlike the big boys out there (Photoshop, Illustrator, Garageband, etc. ), this service is free, and from the bit I have used it, is fairly stable. Most of my experimentation has been done with the Audio editor. Being that I’m on a Mac and usually use Garageband for audio editing, I was quite impressed with the audio editor’s interface. It’s very similar to Garageband. Probably the best part of this site is that it’s not only dedicated to providing the tools, but it provides a tutorial area where you can break down different creations to see how they were built. You’re even given all of the source files so that you can follow along. If you’ve never touched something like Photoshop before, the Aviary toolset will walk you through how to use all of the tools in context as you create your own masterpieces. Try it out and let us know what you think. If you create something with one of the tools, post a link and share. Last summer, I had the opportunity to work with a lovely group of educators from the Montcalm School District. They invited me to lead a two-day teacher workshop on using technology in the classroom. Recently I had a chance to visit their schools and talk to a few of the teachers that participated in the summer training. I’m glad I did. I was pleased to learn that the teachers were using some of the ideas and tools we had discussed in the workshop. It felt good to know that I had a small part in bringing about changes in their teaching strategies. Mrs. Ruggles is an example of a teacher willing to change and take a risk. She had the self-confidence to tell her students she didn’t know everything! She took a risk and let her students use technology even though she didn’t know everything about the tools. She was willing to let her students independently learn how to use the technology. She is a great example of how to develop independent, life-long learners. Mrs. Ruggles is a middle school and high school teacher. One of the assignments that she gave to her art students was to create a poster of an artist of their choice. She had different elements that needed to be included in the assignment: history, favorite work, impact and other information about the artist. She changed her assignment by allowing students to choose how they would present their artist. Imagine, giving the power of choice to students! She pointed them to some online tools and provided some ideas of what they might produce. The students could do the traditional poster if that was their choice. · A traditional poster board that the student took a picture of and posted it on the web. Choice is important to all of us. We want to have a say in our destiny. These projects illustrate the power of giving students a choice. They did excellent work and should be proud of what they have accomplished. Teachers are often threatened by technology and change. They sometimes feel that they are being forced to change what and how they teach. This project illustrates how technology can be used in meaningful ways and is a small step in a much larger picture. I look forward to seeing more great projects from Mrs. Ruggles’ class. Many of you who follow us or have been to BLC are quite familiar with the work of Marco Torres and Alas Media. This holiday season, they are heading up an exciting and worthwhile endeavor. This weekend, they are hosting a day of family portraits, and their goal is to photograph families who might not necessarily have the means to take a portrait. 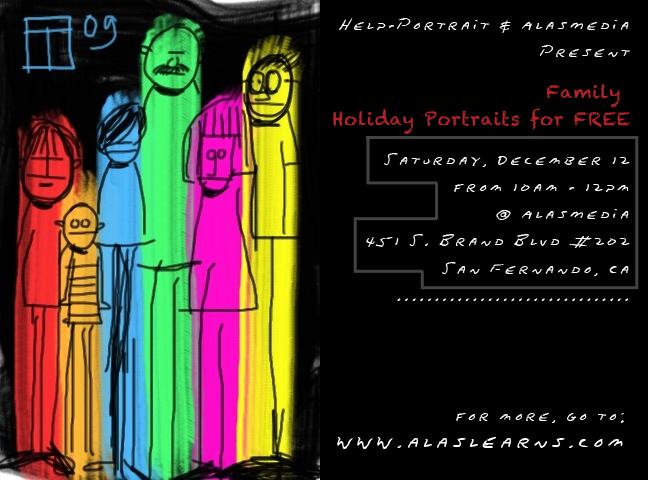 The families that participate will walk away with a portrait to share with their families during the holiday completely FREE. The Alas Media team is looking for financial assistance in purchasing frames for these photos. If you are interested in helping out, please visit http://alasmedia.chipin.com/help-portrait. We are pleased to announce our keynoters for BLC10. Rahaf Harfoush has accepted our invitation to travel from Geneva to share her insights as a key member of President Barack Obama’s campaign media team. Her extensive knowledge of building social networks provides critical insight into building empowering learning environments. She is also the author of the book, Yes We Did. Dubbed “the explainer” by Wired magazine, Dr. Michael Wesch is a cultural anthropologist exploring effects of social media and digital technology on global society. Mitch Resnick from the MIT Lifelong Kindergarten is back to share his knowledge about building a global community with young children engaged with creative inventions.